Ahoy maties! 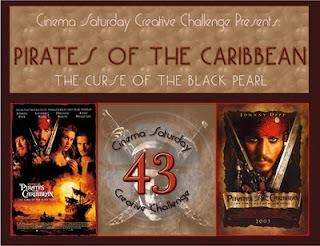 I be takin' this wee break from me week of Our Craft Lounge postin' t' show ye the card I be makin' for this week's Cinema Saturday Challenge! Arrr! So can you guess what the movie is this week?? LOL! That's right, Pirates of the Caribbean!! And I simply could not let another Johnny Depp movie pass me by without making a card!! Here's what I came up with... it wasn't intentional when I sat down to make it, but in the end I didn't include a bit of stamping!! I've had a package of grungeboard for probably a year now, sitting unopened in a drawer. Mark over at Deadbeat Designs went on a little rant recently about how useless it is, so I got it out, determined to make a card pairing it with his stamps to make him love it. But it turns out - I couldn't, I don't really get it either. But since it was already out, and I remembered the package I own has some skulls in it, I had to use it for my Pirates of the Caribbean card! I colored it white by rubbing my Craft ink pad over it. The heart is grungeboard too, covered in paper. There was a requirement this week to include beads, so that's where the random string of beads came from, LOL! 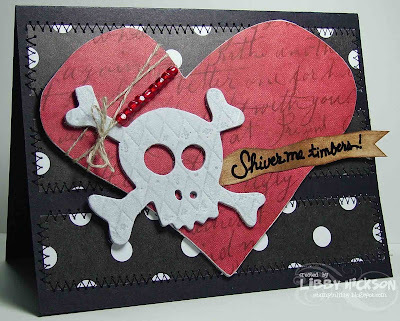 I put the skull on a heart because as I've mentioned before, I do *heart* Johnny Depp - or in this case, Captain Jack Sparrow! I hurt my brain trying to come up with a sentiment for this card, and finally visited the Talk Like a Pirate site, where I found a section on pirate pickup lines!! LOL! In the section for lady pirates, I found "C'mon, lad, shiver me timbers!". HA! Now doesn't that just give this common pirate phrase all new meaning?? LOL! So, I thought it worked for my Captain Jack Sparrow card! :-) Ok now ye scurvy dogs, I be postin' this and movin' on - hearty thanks for stoppin' by me blog today! 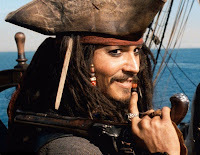 Ahhhh....Jack Sparrow is SO much hotter than that silly little vampire boy that everyone is talking about! Looks good - of course it would also look good if you had used chipboard instead of grungeboard! still, it's a nice layout! I really love this card too! I like the beads. It's all really cool. Very good card for the challenge! I think we had the same grunge board in the drawer LOL. I knew it would come in handy. I like how you've incorporated the Jack Sparrow beads! Yum! I heart your card almost as much as I heart Capt. Jack Sparrow. Shiver me timbers...i guess I shouldn't let me first graders talk like pirates anymore! Love your card! The skull looks good (although I do agree the fuss over grungeboard is surprising! )and the beads fit right in. LIBBY!!!! You can't imagine what seeing my FAVE picture of Captain Jack do to me!!! I seriously almost melted off the couch!!! That picture gets me EVERYTIME!!!! Anyhooooo - sorry for all the rambling - my whole point being that I ADORE this card and YOU and wanted to thank you SO much for playing along with us!!! Sending you BIG BIG hugs!! !